Ineng's Barbecue has been around for close to a decade now but I have only tried their barbecue last month, at the death anniversary of my husband's maternal grandpa. I normally don't eat barbecue but I ate three sticks of Ineng's! 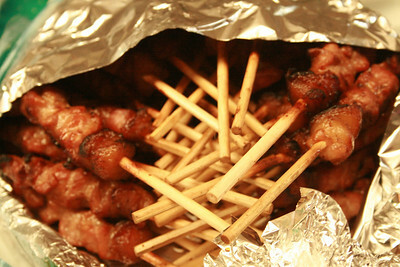 I found it really delicious and the fatty parts at the end of each stick reminded me of sweet tocino. If one wouldn't dare eat those parts, I guess they can collect it (before everybody eats them) and chop them up with fried rice. Yummy!!! Ineng's also offers affordable meals which almost makes me feel pity for those who live and work near their 11 branches. These pork sticks must require an ab workout after because you're not likely to just eat just two sticks. It's really seldom I find meat I can eat without needing rice to go with it. Ineng’s Barbeque, The Link Bldg. 1/Lvl., The Link, North Drive cor. Makati Ave.
super sulit ng bbq nila!